I’ve been in China meeting with members of the International Monetary Fund (IMF) and the New Development Bank (NDB, launched by the BRICS). Here’s what I found out: Green is the new black. 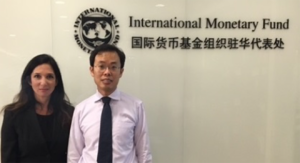 Nomi Prins and Dr. Raphael Lam, resident representative of China for the IMF. As Jim Rickards has explained, the shift away from the dollar as the world’s reserve currency creates an opening for a new global superpower. Other countries are making their moves to fill that spot, and none is moving more quickly than China. China has two big moves lined up, and the first one is happening at the G20 meeting on Sept. 4. Jim Rickards says that this will be the day the dollar dies. This will also be the day China shows that it is an equal to the U.S. and any other country vying for world supremacy. A massive part of world dominance is control over energy. Before, that meant oil. Now, it means green energy. The U.S. and China are racing to control green energy. For China, that’s how they can clinch the title of new world superpower. For the U.S., it’s a last-ditch effort to hold their ground. At one point, having a significant oil stock reserve was a national security priority for White House administrations. Now, sustainable energy is. Why? Because if other nations open avenues of renewable energy sources to run their economies, global reliance on oil and fossil fuels will face competition as a sector. Countries that were once deemed energy resource deficient see a light at the end of the tunnel. This is their chance to break away from the dependency curse that has riddled so many into a debtors’ prison. Nations with more control over oil flow or supply (like the U.S.) will face diminishing political power as the forms of energy used shift toward sustainability (like in China). It’s not just currency wars, but energy wars now, too. The effect of the changing power dynamic isn’t just confined to your opinion on climate change, but to how the money and power behind going green relates to your investment portfolio or your next career. Regardless of political elections and candidates’ beliefs about climate change, these pioneering facilities create green jobs. They also aren’t as affected by extraneous factors like economic crises or wars. The wind will always blow. The sun will always shine. Millions of jobs have been lost in the fossil fuel industry, particularly in coal. In contrast, over the last year, the solar industry added jobs 12 times faster than the rest of the economy — more than the jobs created by the oil and gas extraction and pipeline sectors combined. Nations with less access to their own oil are either buying access or investing in alternative forms of energy. China sees huge opportunity in gaining dominance from new power. China doesn’t have the “Old Power” of the petrodollar and doesn’t have its own oil. The NDB, headquartered in Shanghai, has shaped its mission statement to support sustainable energy infrastructure projects, giving Chinese (and China’s emerging markets partners) companies the funding they need to stay ahead in the race. To fuel its growth, China needs control over as much energy as possible. The sun and wind offer a way. Meanwhile, the New Power Elite from Silicon Valley have mega operations, are involved in multiple government national security contracts, and have increased presence in Washington. The power supply they use to energize their businesses is the power they can access more cleanly, ultimately more cheaply, and in which they can lead the way innovatively. Wall Street is going where the money goes, so we’ll find some of the usual crowd mixed in as we explore the key players on the U.S. side of the energy wars. At the turn of the 20th century, old money and old power expanded from billionaire industrialists, like the Carnegies and Rockefellers, to include billionaire bankers, the Stillmans and Morgans of the world. Their control over the country’s political and economic affairs was built on control of financial and energy resources (More of this in my most recent book). Take the Rockefeller fortune, for example. It was built largely on the success of the Standard Oil Co. in the late 1800s. The Morgan family’s wealth relied on the global reach and domestic influence of the Morgan Bank and the spread of financial capitalism. In the late 1800s, the Morgans funded governments during financial panics. In the 1900s, they helped finance two world wars. The Rockefellers retained their power by achieving industrial, financial and political influence. As the Morgans and Rockefellers grew their profits, they, like other elites, looked to expand their power. They pursued making money from money, rather than from supplying energy to industrial pursuits and physical innovations. Bankers grew more powerful as they expanded their existing empires. This happened in tandem with the United States becoming a major superpower, a role solidified after World Wars I and II. To maintain its superpower status, the U.S. increasingly relied on its control over the dollar as the dominant currency and oil as the dominant energy source. The notion of the petrodollar in the 1970s, or linking petroleum and the U.S. dollar, was politically and financially motivated. Winthrop Aldrich, Chase chairman since 1933, was fixated on the Middle East. His sister had married a Rockefeller, and he believed true power would come from combining oil-related banking and finance activities. The petrodollar was based, in part, on the Rockefeller family aligning Chase with U.S. ambition to become a global superpower. From Aldrich to his successor, John McCloy (lawyer and major establishment operator of the Rockefeller and Seven Sister oil companies), to David Rockefeller (who ran Chase in the 1970s and 1980s), global growth was fueled by oil. The power of these families and banks was enhanced by the petrodollar as a tool of America’s global power. The reason this history matters to us now is because, as Shakespeare wrote: “What’s past is prologue.” The Old Power Elite preserved their fortunes in relation to their involvement in oil as the prevalent source of energy. Now, the New Power Elite are taking the stage. Wall Street smells real money after years of profiting from a high market share in trading commodities. During the era of Old Power, the winning combination of power was finance and oil. We’re watching the transition to finance and sustainable energy as the next power couple right now. That’s why in November 2015, Goldman Sachs announced it would finance and invest $150 billion in clean technology and renewable energy projects over the next decade, quadrupling its prior goal. As far back as early 2014, the banking community began sticking their fingers into the sustainable energy pie. That was when a consortium of the usual players banded together to kick-start the green bond market. A “green bond” is a tax-exempt bond issued by federally qualified organizations or by municipalities for clean energy development. Bank of America Merrill Lynch, Citi, JPMorgan Chase, BNP Paribas, Deutsche Bank, Goldman Sachs, and HSBC are all part of the effort. Last fall, Wells Fargo, the fourth-biggest U.S. bank, said it would cut back lending to coal-mining companies. In June 2016, it announced increasing support for building efficiency startups through the next round of its $10 million philanthropic Innovation Incubator program, administered by the U.S. Department of Energy’s (DOE) National Renewable Energy Laboratory. Morgan Stanley also pledged to reduce its exposure to coal-mining. Citigroup announced it would earmark $100 billion over 10 years for “lending, investing and facilitating” activities focused on mitigating climate change and other sustainability solutions. The money is in green energy. The companies who will benefit from Wall Street’s support aren’t necessarily the usual suspects. Ed. note: “A charmingly mordant take on the stock news of the day, accentuated by philosophical maunderings…” That’s how one leading financial magazine described the free daily email edition of The Daily Reckoning. You’ll find cutting-edge analysis from the complex worlds of finance, politics and culture. Presented in an entertaining style few can match. Click here now to sign up for FREE.